You are our heroes. Ever since you first came to town bringing little dogs for people to love. Chance (12 years) , Girl (11 years), Little and Pee Wee want to say "thank you" for your wonderful flea and tick treatment program to stop the itch. When Angel (10 years ) was dying, your help was invaluable for the treatment of her heart condition. And thank you for your spay/neuter program so people can adopt rescue dogs like Sweetie, who wears her Second Chance sweater proudly. We are grateful that you let us volunteer and donate for your fundraiser because that is how we can help you. Lots of Love: An anonymous admirer. My 1st contact with second chance was @ their monthly flea/tick treatment day at the food bank. Then, when one of my dogs became ill, their name came up in an online search for help. I called and after a few basic questions, I was being seen by the local vet. I was amazed at how kind, quick and helpful this organization is. I've never heard of any such program even existing. The flea/tick treatment program they have set up is always a quick process and they offer a whole array of dog supplies FREE of charge. It's just unheard of. In regards to the help I received with the vet visit, I called Second Chance and they handled everything from that point on, I just had to make my appointment and show up. This community is truly fortunate to have this organization. I just wish the community was more supportive of them. Heartfelt thanks for all you do for the precious dogs in our community. 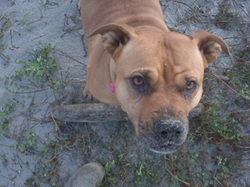 On behalf of Kali, I am so grateful to you for assisting with the cost of her spay surgery. You have provided many services that I would be unable to afford otherwise-–microchip and Frontline, as well as collars, leashes, treats, sweaters, and coats. With your generosity and kindness, Kali has been given a second chance. Second Chance has helped my dog, Molly, and me twice in the last two years Molly was able to receive medical attention and get the medicine she needed to get better. Molly is my best friend. Molly and I can’t thank the people at Second Chance enough. I also would like to thank Second Chance for being there for Radar and Blister. If it wasn’t for Second Chance, their ears would be blown up. Got to love ya. Thanks again. 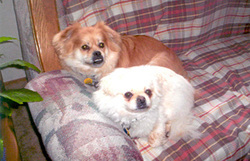 I adopted my two little guys, Sandy and Duffy, from Second Chance. They are brothers, came from Gualala, and are the lights of my life. I wasn’t going to adopt them; I was just going to foster them for a week. That was a couple of years ago; now they are always with me. We come to the monthly Frontline days for them to get their flea/tick treatment and for me to volunteer and help with all the other dogs who come in. Even on the stormiest days, we help more than 100 dogs every month. Sometimes the people are appreciative; sometimes they’re hard to deal with. But we all do it for the darling dogs; we can see their lives are better for what Second Chance can do for them.